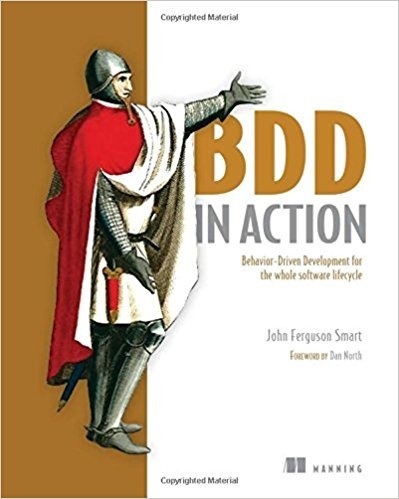 Back to technical reading with this book BDD in Action by John Ferguson Smart. BDD stands for Behaviour Driven Development, a relatively new technique for specifying software requirements. Behaviour Driven Development is an evolution of the Agile software development methodology which has project managers writing “stories” to describe features, and sees developers writing automated tests to guide the writing of code – this part is called “test driven development”. In behaviour driven development the project manager, along with their colleagues who may be business analysts, testers and developers, write structured, but still “natural language”, acceptance criteria which are translated into tests that are executed automatically. The scenario describes the feature that we are trying to implement, and the Given-When-Then steps describe the test, Given is the setup, When is an action and Then is the expected outcome. The developer writes so called “step definitions” which map to these steps and the BDD test framework arranges the running of the tests and the collection of results. There is a bit more to Gherkin than the snippet above encompasses, it can provide named variables and values, and even tables of values and outputs to be fed to the tests. Subsequently BDD frameworks have been written for other languages, such as Lettuce for Python, SpecFlow for .NET and Cucumber for Ruby. There are higher level tools such as Thucydides and Cucumber Reports. These tools can be used to generate so-called “Living Documentation” where the documentation is guaranteed to describe the developed application because it describes the tests around which the application was built. Of course it is possible to write poorly considered tests and thus poor living documentation but the alternative is writing documentation completely divorced from code. Reading the paragraph above I can see that for non-developers the choice of names may seem a bit whacky but that’s a foible of developers. I still have no idea how to pronounce Thucydides and my spelling of it is erratic. BDD in Action describes all of this process including the non-technical parts of writing the test scenarios, and the execution of those scenarios using appropriate tools. It takes care to present examples across the range of languages and BDD frameworks. This is quite useful since it exposes some of how the different languages work and also shows the various dialects of Gherkin. BDD in Action also covers processes such as continuous integration and integration testing using Selenium. As someone currently more on the developer side of the fence, rather than the (non-coding) project manager BDD seems to add additional layers of complexity since now I need a library to link my BDD style tests to actual code, and whilst I’m at it I may also include a test-runner library and a library for writing unit tests in BDD style (such as spock). I’ve had some experience of managing Agile development and with that hat on BDD feels more promising, in principle I can now capture capabilities and feature requirements with my stakeholders in a language that my developers can run as code. Ideally BDD makes the project manager and stakeholders discuss the requirements in the form of explicit examples which the developers will code against. BDD in Action has reminded why I haven’t spent much time using Java: everything is buried deep in directories, there are curly brackets everywhere and lots of boilerplate! I suspect I won’t be using BDD in my current work but I’ll keep it in the back of my mind for when the need arises. Even without the tooling it is a different way of talking to stakeholders about requirements. From a technical point of view I’m thinking of switching my test naming conventions to methods like test_that_this_function_does_something arranged in classes named like WhenIWantToDoThisThing, as proposed in the text. In keeping with my newfound sensitivity to the lack of women in technical writing, I scanned the acknowledgements for women and found Liz Keogh – who is also mentioned a number of times in the text as an experienced practioner of BDD. You can find Liz Keogh here. I did look for books on BDD written by women but I could find none. 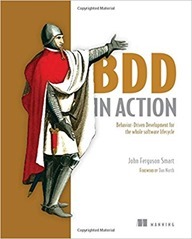 If you want to know what Behaviour Driven Design is about, and you want to get a feel for how it looks technically in practice (without a firm commitment to any development language or libraries) then BDD in Action is a good place to start.